Economic historians divide human societies into three types: hunter-gatherer, agricultural and industrial. Hunter-gatherer societies are usually small groups holding their possessions in common. There are not many left today. They only need to grow enough food for themselves. Their values and moral rules are about holding the community together. Everybody has their place. It’s egalitarian. It doesn’t have powerful members who boss people about. It doesn’t invest in military technology. If it has to fight off enemies it does, but then it goes back to normal. Agricultural societies first appeared just over 10,000 years ago. By developing agriculture, communities could grow more food. They could maintain a class of people who didn’t grow food. Most of the population were still peasant farmers, but they had to grow extra food, which the ruling classes took in tax to maintain armies and slaves. In Micah’s day the two kingdoms of Israel and Judah were of this agricultural type, but retained memories of a tribal past without kings or taxes. They were small kingdoms squashed between the Mediterranean Sea, the desert and two big empires. To the north was Assyria and to the south was Egypt. Kings justified their rule by appeal to theology. Each kingdom had a capital city with a temple to the national god. The god lived in the temple, usually in the form of a painted wooden statue about human size. On this point Israel and Judah were exceptions because their god didn’t have statues. They still had a specially holy room where the god lived. Food. The peasants had to bring animals to the temple. The priests checked to see whether the animals were good enough, then cooked them on the altar, took the meat to the god in the temple, and left the god to eat it. Now here’s a question for you. How much of the meat do you think the god really ate? This system may seem to us to be unbelievably absurd, but different cultures do have very different ideas about what is credible. How many of the priests really believed God ate the meat? We don’t know. What we can be sure of is that they knew their privileged lifestyle depended on other people believing it. They claimed that this was how to please God, so that God would defend them from their enemies and help them win wars. The biblical histories tell us Israel got its first king about 400 years before Micah’s time. Before then they were an egalitarian network of self-sufficient communities. But the Philistines attacked. They needed a leader to unite them against the Philistines. It was King Solomon who turned Israel into an agricultural empire like the others. He had large numbers of slaves, built lots of buildings and lived in luxury, all paid for by heavy taxes. The opposition was led by prophets. Samuel appointed Saul as king and later rejected him. From then on, for 300 years, a succession of prophets appointed kings, turned against them, and led palace revolutions. Why? Because, over and over again, they needed a king to defend them against powerful enemies; but when the king became like the other kings, with a life of luxury paid for by heavy taxes and conscripted labour, the prophets turned against him. Micah did his prophesying towards the end of the 8th century BC. Most of the 8th century was a quiet spell, comparatively undisturbed by invaders. But in the year 738 the Assyrians turned up and demanded a heavy tribute. From then on the situation in Israel and Judah deteriorated. One king after another made an alliance with one of the other states, and then got murdered by opponents and replaced by a king with a different foreign policy. It was clear that the foreign policies of all the kings were disastrous. By comparison, Boris Johnson did very well. In 721 the Assyrians came again. This time they conquered Israel, removed the ruling classes and sent in their own governors. Now think of it from a peasant’s point of view. For all these years we’ve been taking our best sheep to the temple to be sacrificed to God, so that God defends us from our enemies, and then he doesn’t. What was the point? We could have eaten all those sheep ourselves! They could think of two answers. The obvious answer, in that culture – what would have seemed like the commonsense answer – was that the god of Israel was weaker than the god of Assyria. From now on, sacrifice your sheep to the god of Assyria instead. This was the usual pattern. When one nation was defeated by another, gradually people would transfer their allegiance to the winning god, and the old god would get forgotten. When Israel got conquered, many Israelites will no doubt have done just this. But there was another possible explanation. Perhaps Israel’s god had allowed them to be conquered because they had disobeyed God’s laws. Perhaps the kings had been doing the wrong things. The southern kingdom of Judah, with its capital in Jerusalem, survived as an independent state. 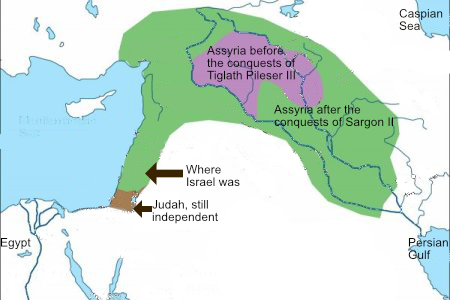 After the Assyrian takeover of Israel we can guess that Judah would have been full of refugees. They will have been asking: how does Judah avoid a similar disaster? The king of Judah had to make a decision. His name was Hezekiah. 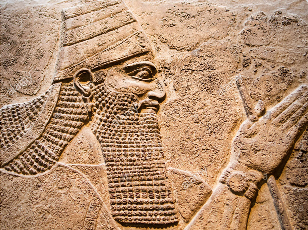 Should he abandon the worship of Israel’s god, and worship the god of Assyria instead? Or should he stick with Israel’s god and be extra careful to obey his laws? Micah and his fellow-prophets believed the god of Israel wasn’t like the other gods at all. The god of Israel was not an imperialist, competitive god fighting wars against other gods. The god of Israel was the god of local, self-supporting, equal societies living in peace, and had been their god long before they had had any kings at all. So the kings should not have been making and changing alliances. They should not have been taxing the people to build themselves fine palaces. They should not have been eating well out of the sacrifices brought by the peasants. Instead they should have been making sure their own people could live well and celebrate the blessing of God’s generosity. King Hezekiah made his decision. According to the book of Jeremiah (26:16-19) he was influenced by the prophet Micah. So he imposed a set of laws, tightening up obedience to the god of Israel. You can read them in the book of Exodus. If you do, you won’t think they are the most enlightened laws ever, but they are what Hezekiah believed was the way to please God, and they were a radical alternative to the laws of most states at that time. If Micah hadn’t persuaded Hezekiah, who knows? Perhaps the priests at the temple at Jerusalem would have sacrificed those sheep to the god of Assyria, and the god of Israel would gradually have been forgotten. But Micah’s case won the day. and he will contend with Israel (Micah 6:1-2). Micah turns the question round. It’s not that Israel has cause for complaint that God has let them down, but God has cause for complaint that Israel has let God down. Micah lists God’s credentials. God is perfectly capable of winning wars, and has done many times in the past. To us, this part of the passage contradicts Micah’s main message because it describes a national god winning wars against enemy nations. However, when we understand the context we can see why Micah included God’s curriculum vitae at this point. It is not that the god of Israel is weaker than the god of Assyria. The evidence makes it clear that God is perfectly capable of winning wars. The issue at stake is different. Here’s the point. Yes, all those sheep you took to the temple to be sacrificed to please God and keep the nation secure against its enemies, sorry but you are quite right: they were a complete waste of good meat. You might as well have eaten them yourselves. So what did God want us to do instead? You knew all along. Ever since the days before we had kings, the God of Israel has been a god of peace-loving communities who look after each other, share their resources with each other, and resist the temptation to lord it over each other. 1) Micah argued for a cooperative small-scale society, and criticised competitive rulers fighting against enemies. What kind of society is ours today? 2) The system of sacrifices benefited the ruling classes by exploiting ordinary farmers. Do we have exploitative systems today? 3) Do you admire conquerors, or do you wish they had stayed at home?